Bulgarian and Greek sopranos to replace Anna Netrebko in the role of Marguerite. 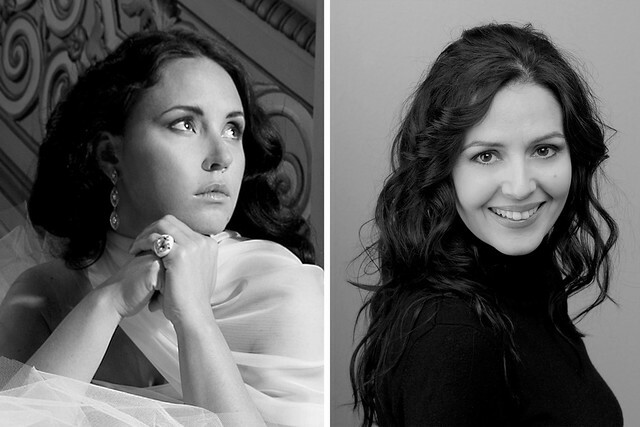 Following the announcement last week that Russian soprano Anna Netrebko has withdrawn from Faust, the role of Marguerite will now be shared between sopranos Sonya Yoncheva and Alexia Voulgaridou. Bulgarian soprano Sonya Yoncheva will sing the role of Marguerite on 4, 7, 17 and 22 April, making her role debut with The Royal Opera. She will also perform the role for Vienna State Opera in May, again replacing Anna Netrebko. Yoncheva made her debut with The Royal Opera in Plácido Domingo’s Operalia Winners’ concert in July 2012 and also sang the role of Musetta in La bohème for The Royal Opera in the 2012/13 Season. She made her debut at the Metropolitan Opera, New York as Gilda in Rigoletto in December 2013, and recently sang Lucia in Lucia di Lammermoor with the Paris Opéra. Greek soprano Alexia Voulgaridou will sing the role of Marguerite on 11, 14 and 25 April. She has previously sung the role in Rome, Catania, Hamburg and Valencia. She made her debut with The Royal Opera as Mimì in La bohème in 2008. Her recent performances include Cio-Cio-San in Madama Butterfly in Tokyo, Mimì in La bohème in São Paulo, and the title role in Tosca in Trieste, Lausanne and for Opera Australia. The rest of the cast remains unchanged. Question 1. Will these excellent but lower profile singers be paid the same as Netrebko? Question 2. If paid less, will we see a small refund on the ticket price or will the ROH pocket the profit? Thank you for your questions, which I am not in a position to answer. The late stage at which we have had to contract these singers will most likely mean that the cost will be higher than you assume. Although a refund is very unlikely, as the Royal Opera is not a profit-making organisation but a charity there won't be any pocketing going on! if you go to opera, just for the "stars" of the singer, and took tickets for place, where you can be seen...you should start again, from the first opera event in your life. Having seen Sony Yoncheva at ROH and heard her in Rigoletto from the Met I think she is a star soprano! Sonya Yoncheva is probably the hottest new soprano talent in the operatic world. You couldn't ask for a better replacement. Thank you Covent Garden! Not sure which star sopranos you expect to be able to get at one month's notice. Ellen what do you mean? The link you provide doesn't clarify anything. Apologies James, I didn't respond clearly as I was in a rush. I would still maintain that cast changes can lead to wonderful discoveries, but entirely understand your disappointment. I think I will stay with my April 11th performance to see with Ms Voulgaridou, although Ms Yoncheva could be the hit. As England skipper John Pullin said in Dublin after losing 18-9, "Well we might not be any good, but at least we turned up." Enough of show ponies. I would rather have reliability when booking months in advance. it is disappointing to see how opera singers could be disrespectful with their audiences. Sonya Yoncheva was supposed to sing LUCIA at the Deutsche Opera at these dates and she decided to cancel those performances to show up in London. Miserable..
Jean frederic saumont, take a chill pill. Bravo ROH - although I had hoped Sonya Yoncheva would do all performances, I am more than happy I get to hear both these excellent up and coming sopranos. I agree, however good these singers are, we should not be benefiting from other people's loss. Covent Garden should not be allowing singers to cancel other engagements at major opera houses just to plug gaps in London which evidently resulted from improper planning. There must be up and coming wonderful young singers dying to sing in Faust who are at home twiddling their thumbs. I think the whole situation is completely unacceptable and the ROH should give a 25% refund on the cost of tickets and sue Anna Netrebko for the cost due to breach of contract. The excuse of 'the role is not right for me' is simply unacceptable' that should have been known if that is the case BEFORE accepting the role. John, you (and others here) may not realise, but singers at this level are usually contracted several years in advance of a production - I know of singers who are booked up to seven years ahead, and I would imagine Ms Netrebko falls into this sort of category. With the best will in the world, voices change, and a role that was perfectly fine even a year ago can, very suddenly in some cases, no longer 'fit' - and singing the wrong repertoire can have long-term effects of a decidedly negative nature on what is, essentially, a fairly fragile set of catrilege and soft tissue. As Ms Netrebko starts to explore a much heavier repertoire, I'm not in the least surprised that she cancelled the upcoming Marguerites (though I'd agree that withdrawing so late in the game is not desirable, or a way to win/retain fans). Just thought you might be interested to know that opera planning is a much, MUCH longer-term endeavour than most of the public are aware. Yoncheva can't sing all performances because she is singing La Traviata in Munich in between. Dear John, at least the excuse of 'the role is not right for me' is honest (even if I agree that such a late annoucement is problematic). She could have cancelled at very short notice claiming that she was sick (and then avoid critics about her choices), and the theater would have been embarrassed to find a good substitute. Did Miss Yoncheva put a private jet in her contract with ROH to travel from Munich to London to Munich to .. in april ? How can a reasonable opera house like ROH accepts that a young artist sings Traviata and Faust simultaneously ? In what state will be Miss Yoncheva's voice in April during the performances, and after ? There is no Lucia di Lammermoor scheduled for April in Berlin. Therefore it is a bit difficult for Sonya Yoncheva to withdraw from it... However there is Lucia scheduled for March and Mrs. Yoncheva is still singing the title role (at least according to the Deutsche Oper official web site). Also she is still listed in cast for April Traviata Munich performances. Not much to be excited about. Even though listening to new voices may be a valuable experience, I'd rather prefer to choose when and where to do it. I wouldn't have bought plane tickets from abroad and made hotel reservations, besides of course the tickets expense, if I had known this at first place. This is the 4th time in the recent past that this has been the case, with tickets bought in advance for performances at the ROH. Besides the recurrent disrespect that some top singers show towards the audience, I'd suggest the ROH to change its policy towards artists and their withdrawal habits, if not to be considered untrustworthy and unprofessional. Dear Gorazd, Sonya Yoncheva has withdrawn from performances as Donna Anna in Don Giovanni in Berlin to do this - she is still listed on Operabase but the opera house website announced her withdrawal last week. So London gets the benefit - but of course it's not very nice for her German audience. Thanks Royal Opera house. Sonya Yoncheva is far batter than netrebko right now. Let netrebko ruin her voice by singing trovatore / manon lescaut / and Macbeth!!!! Let her sing at the Met that's the right place for her. Are you saying that after listening both ? Because Miss Yonchava has come to me 4 times in the past year as a replacement in Traviata, Lucia, Juliette, and Hoffmann's Tales (by the way usually everytime she replaces somewhere, she also cancels elsewhere), and definitely NO she is not "far better than Netrebko".. Her voice is great, but she is not the stage animal Netrebko is, and she still lacks the emotion.. may be with some work and concentration, if she takes time for that ! Thank you for your email. I can completely understand your disappointment, especially when you had booked for such a special occasion. While we do everything we can to avoid cancellations all casts are subject to change. We sell tickets on the experience of seeing a performance at the level to be expected at the Royal Opera House rather than to see a concert with a particular singer. I hope that you will still have a very enjoyable evening. Delighted to have managed to get a ticket at last as some cancel on news of AN's withdrawal. It must be a nightmare for the ROH when singers cancel, so well done for announcing replacements. I am very much looking forward to the performance, which I'm sure will still be excellent even without "star" name. My question for the ROH: How do you manage to make Miss Yoncheva cancel her performances in Berlin? Did you contact the Deutsche Opera managment? Are THey happy With the outcome? As a member of the audience, in Berlin and London, i do Believe that i am entitled to konw! for the performance on the of April 22nd. know the answer to this mystery. We will check this question after the weekend. 55 , not 90, in the stalls for 22nd April. This is the third attempt I have made to see A.N. (at great expense) and every performance has been cancelled for quite unacceptable reasons. I shall never bother with her again. I also agree with Val, we had booked to see the performer, AN, having fallen in love with her voice and performances. This was to be our first, (possibly of many) live opera but for us also the shine has also definiately been taken off and we are no longer looking forward to the show. Ellen you can say you are selling a performance and refer to your Terms and Conditions but you have been advertising and promoting this Opera with a specific cast and at inflated prices for well over 12 months. You can fool some of the people some of the time, but you cannot fool all the people all the time..
You have a duty to keep your customers happy and cannot hide behind your Terms and Conditions. I agree with Val that the realistic price now for these tickets is 25% less than has been charged for them. I'm getting a little bored with the 25 percent chorus. If you feel that Faust will be under-starred and not to your liking, you're welcome to return your ticket - there are plenty enough people who wouldn't mind seeing a 'star-less' opera with Calleja, Terfel and Keenlyside, or who just happen to like the opera itself and who quite happily buy your return. There are some singers who don't appear as often as they are booked - don't spend a fortune on trying to see them and then feel hard done by because they didn't show again. Dear Ellen I agree with John, you can't hide behind terms and general conditions, it will be in Your interest to promote the ROH while Your explanations only provoke and create more frustrations among customers (I feel strong sympathy with Val). Yoncheva is definitely not Netrebko: I paid £200 "to experience" Miss Yoncheva?Wow!! Since you are trying to substantiate your answers with the wonderful male cast, well I experienced Terfel and Keenleyside at the Wiener Staatsoper and Calleja at the Deutsche Oper for far less than £200! Therefore I consider a 25% refund only fair in this situation. This will probably increase the audience's trust in the ROH for the future and I think in the long run this will pay off for the ROH. So many glory-hunters here. You can tell they don't care about anything art-related but are concerned with the bragging rights of seeing some hyped-up media product. Serves you all right. "Stage animal" - if that means singing out of tune, then I need to redefine this in my dictionary. I would send back my ticket, but I cannot cancel my train ticket/accommodation. I too will be wary in future! The usual mixed bag of comments. I have experienced big names cancelling for a variey of reasons, usually health. It is not expected a partial refund is made, just the luck of the draw. What sticks here is the decision to pull out on artistic grounds, and so late. For that reason, I would expect the ROH to make some amends. That said, I booked for the the production, not for 'bragging rights'. What a pathetic comment that was. I can assure you that I am not a glory hunter. I WAS a big fan of Netrebko and adored her voice, and for the chance to hear her sing live purchased Friends Membership and the best tickets that I could afford. As others have said the ROH heavily promoted her appearance to sell the tickets with front page feature on their brochure etc. Even if I resell my tickets I am left £80 out of pocket, never mind hotel costs etc. Thank you Anna Netrebko and the ROH. Ellen, your silence in response to my comments is deafening. If you paid that much, then you assumed the risk. Cancellations are a natural thing. I, for one, would never pay 200 pounds for any sort of ticket. It is just not worth it. Opera is just like any sort of entertainment at the end of the day. So, all of this falls under the category of "too bad". Exercise better judgement next time. Paulo I'm not quite sure why you are being quite so hard on some of the people on here. Most people who might like to see such a cast at the ROH would never have the opportunity. For many, going to the ROH is a very special occasion, and a costly one. Perhaps this might be the only occasion they can afford to see the stars advertised and sit in a decent seat close enough to the stage not to need binoculars. I too am very disappointed that Netrebko has pulled out at such a late hour, it really isn't good enough for lead performers to do this (Gheorghiu is a prime example). Before you castigate others for buying top price tickets perhaps you might consider that the price of your cheaper tickets is subsidised by those paying a lot more. If some of us weren't prepared to pay top price then all tickets would be significantly more expensive. Think about that before you lecture others on their choices, and treat them with a little courtesy instead. "My question for the ROH: How do you manage to make Miss Yoncheva cancel her performances in Berlin? Did you contact the Deutsche Opera managment? Are THey happy With the outcome? As a member of the audience, in Berlin and London, i do Believe that i am entitled to konw!" I'm afraid that we cannot share details of negotiations with artists, this is more a question for Sonya Yoncheva's management. I heard Mrs Yoncheva in Lucia di L. in Paris in october 2013. It was horrible ! I heard Anna Netrebko in Manon Lescaut in Rome on 6th of March. It was wonderful. Mrs Voulgaridou is a marvellous artist. She is the best Cio-Cio San I have ever heard but I wonder what she can do in Marguerite. She will sing in Bari in october (il trittico + Suor Angelica). I got tickets and will go just for her. Yeah, it was horrible. That's why she got a long standing ovation after her mad scene. I look forward to whoever is performing. There are still some big names in the production to justify the pricing and I'd definitely not give up because AT decided belatedly that her reputation was bigger than her fans. ROH got rid of the Opera Company and decided to rely on visiting singers. Inevitably their loyalties are to their career and not to the Company or the House. That has some good points - you get to see international stars - and some bad - they cancel when it suits them. I am sorry to see the Royal Ballet going the same way. Loyalty to careers, instead of loyalty to the Company. I too booked specifically because AN was in the cast and without the added expense of joining the friends of covent garden only just managed to get tickets despite trying form opening time on the first day. So how about a chance at the tickets next time she appears after the friends booking opens but before the public booking for those who booked for this staging and don't cancell? Anyone disappointed by Netrebko's no show can at least look forward to the magnificent Bryn Terfyl (I went a couple of times when he performed in Faust, and he was fantastic). I have heard Netrebko several times in London and Paris, and each time she contributed a lot to the success of the performance. Last time I booked for an opera with her at ROH she pulled out, and the performance was relatively disappointing. ROH are to be commended for at least trying to book her, considering that past experience could incline both the House, and to audiences who book because they particularly enjoy her singing, that the chances of seeing this wonderful and mercurial performer is something of a lottery. Toi toi (as they in German) to the singers who will take her place. Congratulations to Miss Yoncheva. I saw her last night (opening night 4th April). She sang very very well.